Author's notes: Posting is a pain in the @$$. Sometimes, I had no issues; other times, not so much. Tried attaching the SSW file, but it did not work (apparently, it is not allowed). Anyways, back to the topic; what if the Linebacker was remade as a medium 'mech? Let me know what you think. 21.5 tons of pod space. already looking at alternatives, and eventually phasing it out. known as the Linebacker III, with the first of these Omnimechs making their debut in late 3062, as part of Clan Wolf-in-Exile's "Project Chihuahua"
heavily influenced by its 65-ton progenitor. Ferro-Fibrous Armor, while a Starfire 300XL fusion engine allows the 'mech to reach speeds up to 97 km/hr, while accomodating up to 12 double heat sinks. Overall, this left the Linebacker III with respectable 21.5 tons of pod space to work with. Medium Lasers and an SRM-6 launcher. A total of 16 double heat sinks help keep waste heat under control. features a pair of ER Medium Lasers, a Medium Pulse Laser, and an SRM-4 launcher. Two more double heat sinks help mitigate heat issues. against enemy electronics, while five Jump Jets would allow the 'mech to reach ideal sniping spots. of Streak Ammo. Additionally, the 'mech carries an Active Probe to allow it to detect hidden enemy units. Heavy Medium Laser on each side torso, all tied to a targeting computer. Eighteen double heat sinks are barely able keep the high heat load in check. 130 km/h in short bursts. weapons are fired at once. Omnimechs for the first time against the 7th Talon on Blue Hole; the 7th Talon were overwhelmed by the Exiled Wolves, and were forced off-world. Linebacker III Omnimechs were deployed effectively against the 2nd Royal Guards. Wolf-in-Exile touman, the 1st Wolf Legion has the highest number of Linebacker III Omnimechs in their ranks, with their cluster having developed a fondness for them. 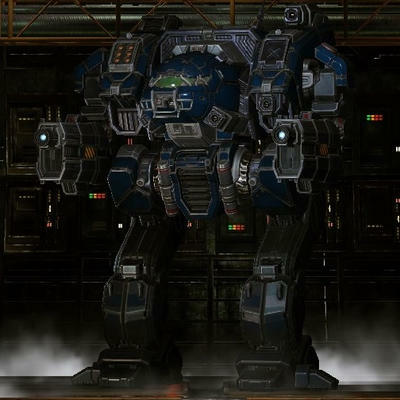 scrapped, in favor of recreating the Linebacker as a 50-ton 'mech. I think it is very well thought out. Early on in the Clan fictions, the point was made that the Clans strongly believed in not wasting resources. That combined with the intense competition between the Clans, it makes perfect sense that no clan can afford to stand still when it comes to the omnimechs that bullwark their front line forces.